Delivery of the aircraft carrier Gerald R. Ford (CVN-78) has been pushed back again, this time by about a month and a half due to ongoing first-in-class challenges. Navy spokeswoman Capt. Thurraya Kent told reporters that the ship’s current estimated delivery date is now November 2016, though the program manager told USNI News in May that delivery was on track for late-September. 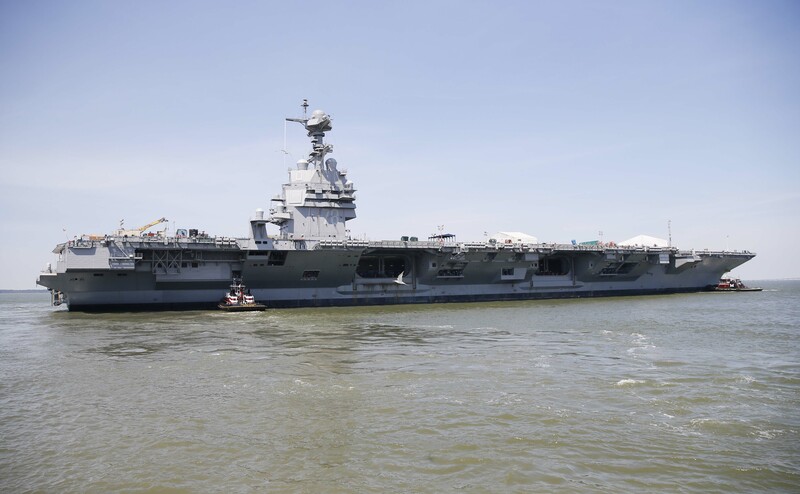 Kent said that “during the ongoing testing of developmental systems onboard the CVN-78, first-of-class issues are continuing to be resolved” and that if additional challenges arise the date could be pushed back further. Naval Sea Systems Command spokeswoman Colleen O’Rourke told USNI News that no one system caused the delay, but rather the Navy and shipbuilder are “working through some first-of-class issues” generally. The ship was originally planned to deliver to the Navy in March 2016. That was pushed back by six to eight weeks, as announced in September 2015, due to “deterioration” in progress that would cause a slip in the ship’s test schedule. Problems with the Advanced Arresting Gear threatened to further delay delivery, but then-Program Executive Officer for Aircraft Carriers Vice Adm. Tom Moore told USNI News in October 2015 that, even though AAG wouldn’t be certified to trap all the different aircraft types prior to the ship’s delivery date, that work would not affect the ship’s delivery date. Even when that manned AAG testing and certification effort in New Jersey started nearly two months late, CVN-78 Class Program Manager Capt. Chris Meyer told USNI News in May that the ship was on track for a late-September delivery – which reflected a further delay beyond the previously announced eight-week delay but was not a result of AAG testing challenges. Meyer explained that the delays in the AAG tests – which are taking place at a ground facility at Joint Base McGuire-Dix-Lakehurst, N.J. – would have little to no operational impact on the ship because AAG installation and testing could take place concurrently. The Navy already understood that the AAG system would be installed but not tested when the ship delivered, and the aircraft recovery tests would take place post-delivery during the six-month post-shakedown period. “It’s important to remember that we’re not going to start on day 1 on the ship launching and recovering fleet aircraft,” he said of the ship shakedown. The island on the flight deck is shaped and located differently than is the island on Nimitz-class carriers, and the Navy will need to measure how that will affect the wind patterns for flight deck operations. Early at-sea testing after the ship’s delivery will support rotary wing dynamic interface testing, Meyer said, followed by air traffic control certifications with its new radar systems, and eventually Electromagnetic Aircraft Launch System (EMALS) and AAG testing with test squadrons. It is unclear what role, if any, AAG played in the most recent delivery delay, with Navy spokespeople declining to discuss individual systems. “This situation is unacceptable and was entirely preventable,” the statement continues. “The Ford-class program is a case study in why our acquisition system must be reformed – unrealistic business cases, poor cost estimates, new systems rushed to production, concurrent design and construction, and problems testing systems to demonstrate promised capability. After more than $2.3 billion in cost overruns have increased its cost to nearly $13 billion, the taxpayers deserve to know when CVN-78 will actually be delivered, how much developmental risk remains in the program, if cost overruns will continue, and who is being held accountable. McCain singled out the AAG program, noting it has seen more than $600 million in cost overruns and should trigger a Nunn-McCurdy critical breach. “As the Department of Defense Inspector General reported last week, ‘Ten years after the program entered the engineering and manufacturing development phase, the Navy has not been able to prove the capability or safety of the system to a level that would permit actual testing of the system on an aircraft carrier,’” McCain said. The Navy could not immediately characterize what testing was left between now and delivery. As of last month, ship construction is 98-percent complete, 97 percent of the spaces have been turned over to the Navy and 89 percent of shipboard testing is complete. EMALS tested completed in May, with 242 total dead load launches – large weights to simulate the various aircraft types that will launch from the ship – among all four catapults. All six dual-band radar arrays, three of them multi-function radar arrays and three volume search radar arrays, have been energized at full power, and the MFR arrays have tracked targets of opportunity in the area. The ship’s propulsion plant is still being tested, and the ship turned itself around in a “turn ship evolution” June 11, which was the first time the ship had moved from its pier since it left the dry dock in November 2013. O’Rourke said the evolution demonstrates that the crew can safely get the ship underway and also allows the remaining testing to take place once the ship is facing the opposite direction.